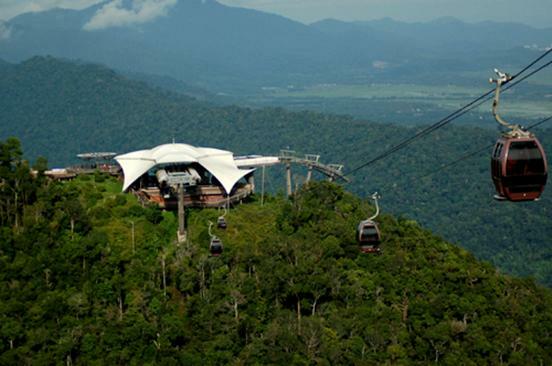 The base station of the Langkawi cable car system is located at the foothills of the island’s majestic Machincang mountain range, within an attraction known as the Oriental village, located on the south-western half of the island, accessible via a half hour ride from Kedah. The Oriental village consists of a cluster of thirty buildings that display elements of traditional Malaysian and Oriental architecture, and host various retail stores, food and beverage outlets and kiosks occupied by diverse adventure travel operators. Since Langkawi is one of the many duty-free enclaves in Malaysia, the Oriental Village offers visitors the opportunity to combine a bit of duty-free shopping with an exciting cable car ride. From this base station visitors are transported upwards in the system, by way of modern gondolas(sky cabs) that offer stunning views of the surrounding verdant forests, the Telaga Tujuh(Seven wells)falls and the crystal blue waters of the Andaman Sea. As visitors glide above the lush terrain, they are awarded with sightings of much native flora and fauna of Langkawi in the form of eagles, hornbills and other birds. The Middle station is located at the end of a stretch that extends over 1700 meters. This spot is located at a height of 650 meters above sea-level on the eastern ridges of the range and provides access to the eastern cliffs, with their three vertical chimneys and panoramic 360-degree views. Viewing platforms located at the Middle Station enable visitors to study the unique rock formations of the Machincang range, formed more than 500 million years due to much seismic activity during the Cambrian period. After enjoying the stunning views from the middle station, visitors are then transported to the top station of the cable car system which is located a further 450 meters above sea level. Once visitors have reached the Top Station, a short walk up the stairs transports them to the summit of Machincang Mountain. From here they are awarded with 360- degree, awe-inspiring views of the gorgeous Langkawi islands, parts of Southern Thailand and the rugged Machincang mountain range. The Top Station provides views which are not available anywhere else on the island; hence this exhilarating ride on the Langkawi cable car systems is a definite must-do on any trip to the island. The Sky Bridge is a curved suspension bridge that is located on the top of Machinchang Mountain. Accessible from the Top Station, this bridge which is suspended from an eighty-two meter single pylon dangles approximately 100 meters above the ground. It provides visitors with an unmatched spatial experience, as it affords them outstanding views of the virgin forests that lie beneath the bridge. This curved Sky Bridge measures 125 meters in length and is a true architectural marvel that required much ingenuity and effort to build. The Sky Trail is a mini jungle treks that is offered to visitors as an additional attraction of the cable car system. This trek which extends over a distance of 2.5 km links the magnificent Telaga Tujuh (Seven Wells) falls to the Middle and Top stations. The path for the hike has been carved out of the mountainside in order to provide visitors with a safe but thrilling experience. Another small path has also been created between the Middle and Top stations to enable newbie hikers to enjoy a similar, safe but yet exciting hiking experience. The administrators of the Langkawi cable car system and Pos Malaysia have collaborated to set up a Pos Malaysia box at the Top Station at a height 708 meters above sea level. From here visitors can post postcards, letters and greeting cards to friends and family, describing their triumphant ‘I was there’ moment, thus inadvertently advertising the unrivaled charm of the island of Langkawi and its spectacular cable car system.